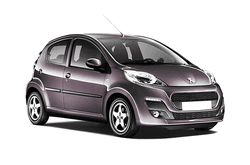 The Peugeot 107 - this is a fun mini car that has the best of both worlds! Its small design means it is incredibly fuel efficient and is also a fun and stylish model to use for any transportation needs that you may have. On the other hand, it is elegant and comfortable to drive; it is also a safe vehicle that rates high on safety tests of compact cars like it. It comes with 5 door access an seats 4 with cargo room added on as well. Airbags and ABS come standard on every Peugeot 107 and they are also available in a range of colours. With great mileage and fuel efficiency, this is a popular model for vacationers and business trip attendees who want some style with their freedom. Try it out today and see the difference yourself!